Like cars, motorcycles can also be refinanced. If you've decided to refinance your motorcycle to get a lower rate and thus lower your payments, you'll find that the process and financial requirements for refinancing are basically the same as those you dealt with to get the original loan. Check your credit report before applying for a new loan to be sure there are no errors or wrong information. Lenders look at your credit report to help determine whether they will approve a loan for you and the interest rate they offer. If you find any problems, fix them before you apply for the new loan. Contact your current lender for your payoff amount since your new loan is based on that. If applicable, any fees that are attached to the new loan or early payoff penalty fees for your current loan will be added to the new loan amount. Your lender will be able to give you a payoff amount that is usually valid for a set amount of time, such as two weeks. Call several lenders about their current motorcycle loan rates. The rates lenders offer vary, and some may even have special interest rates for qualified borrowers for a limited time. Make a list of lenders that have the best rates or specials and select the one that best fits your needs. 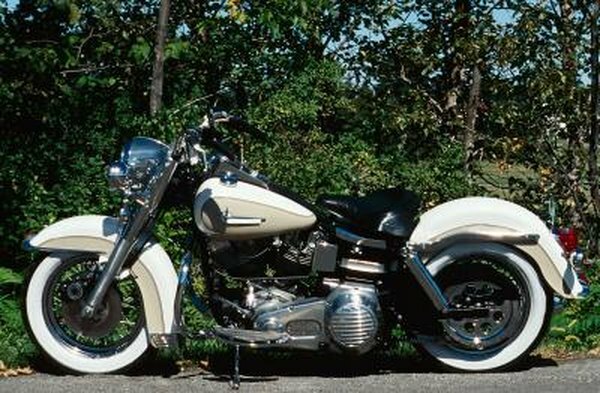 Hire a professional appraiser to determine the current market value of your motorcycle. An accurate and current appraisal of the vehicle is a vital piece of information that the lender needs to determine how much to lend you. Some lenders only work with a list of approved appraisers, so it's best to contact the lender first to make sure the appraiser you want to hire is acceptable. Apply for a new loan. You'll likely need your current address, place of employment, salary, recent taxes and current loan paperwork to complete the loan application. Ask the loan officer for a list of all the materials he needs to complete the application. Fill out the application and submit it to the loan officer. You will receive notification from the lender when the loan is approved. Upon approval, the lender will mail a check for the loan amount to you. Pay off the balance on your old loan with the money from your new loan and close the account. Follow up after a few days with your old lender to confirm that the account is paid off and closed to avoid any issues later. Don't apply for several loans simultaneously because having your credit checked repeatedly in a short period of time will lower your credit score. Review the terms of any loan contract carefully for hidden costs and fees. Is it Wise or Smart to Refinance With the Same Company or Bank?